I this special episode, Micah Christensen sits down with the renowned artist Gary Ernest Smith to discuss the Art & Belief movement that Smith was instrumental in organizing in the 1960s. Held as a live interview and Q&A during the final night of the 2017 Zion Art Invitational, the interview dives into Smith's work and where LDS art has come in the last half-century. 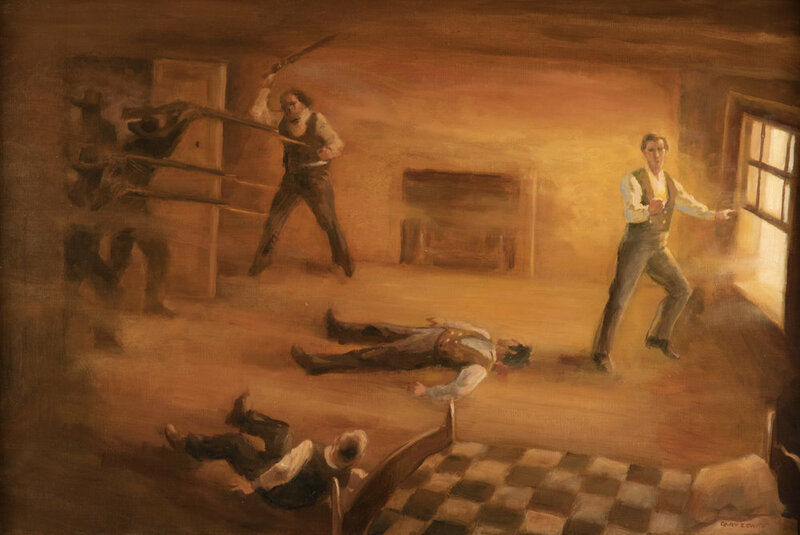 The Martyrdom of Joseph Smith by Gary Ernest Smith. Oil on Linen. 20 x 30 in. Collection of the Artist. Note: Please excuse the audio quality on this particular podcast, it was recorded remotely in front of a live audience. We sit down with Colby Sanford to discuss a very, aesthetically different piece by Bruce Hixson Smith titled Jacob & Leah, now on view at the BYU Museum of Art in the Interpretation Thereof Exhibition. Sanford also discusses his background, training in ceramics, life in China, and the only four colors that matter. Jacob & Leah by Bruce Hixson Smith. On View at BYU Museum of Art. Courtesy of the Artist. 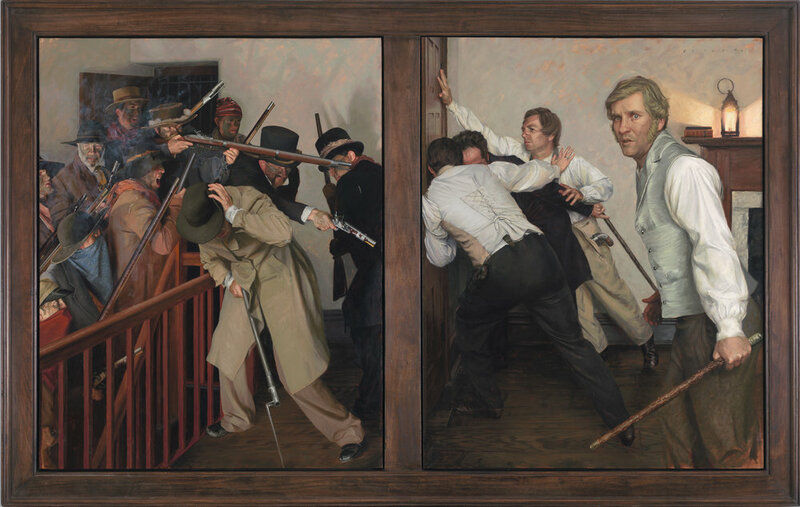 For the first time, we sit down with a collector to get a new perspective on the state of LDS art and what it means to those who come to own those works. Cris owns several works, most notably a work by Brian Kershisnik on display at the LDS Conference Center in Salt Lake City. Learn more of what it means to be a collector and how to get started buying LDS art. She Will Find What Is Lost by Brian Kershisnik. Collection of Cris Baird. Lazaros, (α 8.5h 22.5m 20.02045s / δ -14.5° 0′ 14.059″), 2015, airbrushed acrylic on canvas, 74 x 111 in. Collection of Cris Baird. This week, we talk with the renowned artist Casey Childs to discuss one of his favorite religious works of art, Agony in the Garden by Frans Schwartz. Virtually unknown until the work came to BYU with the Sacred Gifts Exhibition, this work has become a favorite of artists and enthusiasts alike. Casey discusses Schwartz use of color and light and the ultimate effect of the emotion of the painting. Agony in the Garden (1898) by Franz Schwartz. Oil on Canvas. Courtesy of Norresundby Kirke, Denmark. Agony in the Garden at the BYU Museum of Art. 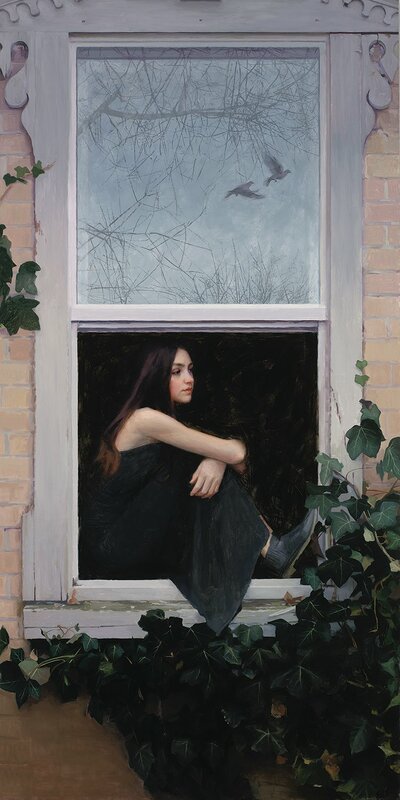 Take These Broken Wings by Casey Childs. Oil on Canvas. 48 x 24 in. Collection of the artist. Greater Love Hath No Man by Casey Childs. Oil on Canvas. 60 × 96 in. Courtesy of the Church History Museum. 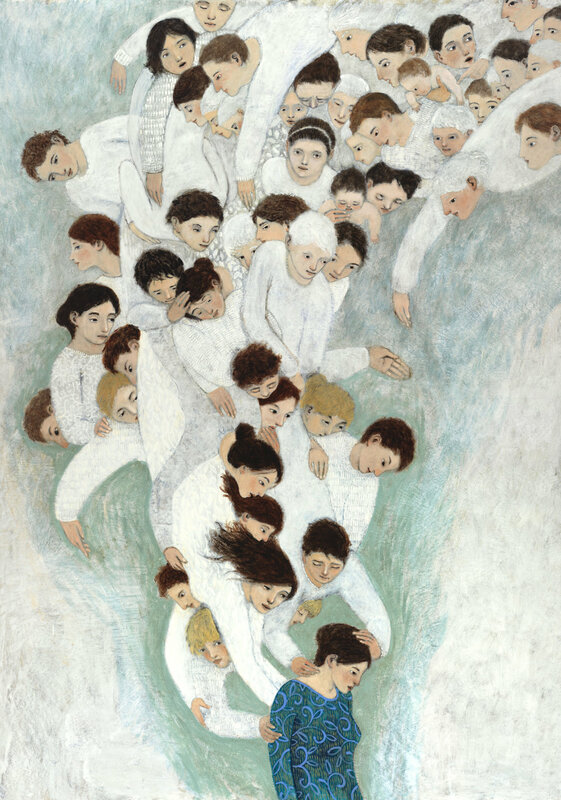 Artist Jenedy Paige discusses the devotional art of LDS painter Ron Richmond and how the ambiguity in his work helps her to better understand how her art can be revelatory to herself and others. Talking through Richmond's portrayal of the Resurrection helps inform the issues that she faces in portrayals of sacred imagery in her own work. Exultare (no. 1) by Ron Richmond. 50 x 31 in. Oil on Canvas. Private Collection. Holding Back by Jenedy Paige. 12 x 20 in. Oil. view more of Jenedy's paintings on her website. Learn about the process of Jenedy's work Let Go on her blog. In this special episode, we speak with up-and-coming artist Gustavo Ramos who moved from Brazil, to Arizona, to Southern Virginia University and finally Salt Lake City to study painting. His studies have led him to the Hein Academy of Art where Ramos hopes to develop his talents in the vein of a personal inspiration, Walter Rane. He is not here by Walter Rane. In 1890, President George Q. Cannon sent 5 young artists from Salt Lake City to Paris to study painting in preparation of the completion of the Salt Lake Temple. After convincing the Church to sponsor John Hafen, Lorus Pratt, JB Fairbanks, Edwin Evans, and Herman Haag left for the Academie Julian to study painting under the great French Impressionists of the Belle Epoque. In this special episode, we discuss their background training, and impact on Utah Art in the 20th Century. Grain Fields (1890) by Edwin Evans. Oil on Canvas. Brigham Young University. 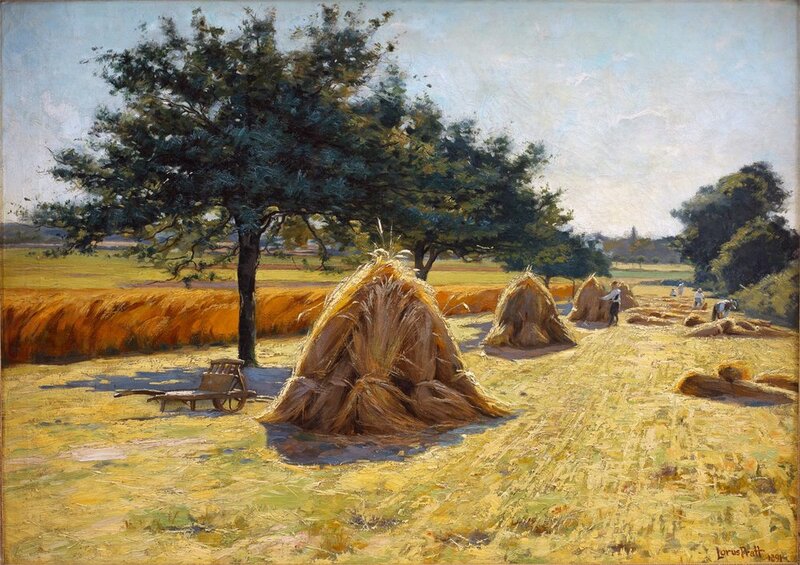 Haystacks (1891) by Lorus Pratt. LDS Church Collection. Haystacks (1937) by JB Fairbanks. Private Collection. The Death of Laban (1894) by Herman Haag. LDS Church. The Tree of Life (1891) by John Hafen. Oil on Canvas. Private Collection. The Garden Room. Salt Lake City Temple, c. 1970. Photograph of the Garden Room in the Salt Lake Temple of The Church of Jesus Christ of Latter-day Saints (1909). Source: The House of the Lord by James E. Talmage (1912). This week we stray a little bit from work by LDS artists in pursuit of becoming a "Mormon Michelangelo" to look at the Michelangelo at his peak. The tomb of Lorenzo de Medici, his patron, friend and father figure is a part of the Medici Chapel in Florence, Italy where Hall studied marble sculpting and had a transformative experience in front of this renaissance masterwork. As the recent recipient of the Alex J. Etta Grant from the National Sculpture Society, Hall's work follows the traditional techniques started in Italy centuries ago. The Tomb of Lorenzo de Medici with Dusk & Dawn (1524-1531) by Michelangelo Buonarotti (Italian, 1475-1564). Marble. 630 x 420 cm. Sagrestia Nuova, San Lorenzo, Medici Chapel, Florence. Outside the Circle (Front) by Michael Aaron Hall. Bronze. Outside the Circle (Back) by Michael Aaron Hall. Bronze. Emily Larsen Boothe is the Assistant Curator at the Springville Museum of Art and is responsible for organizing exhibitions and shows throughout the year. 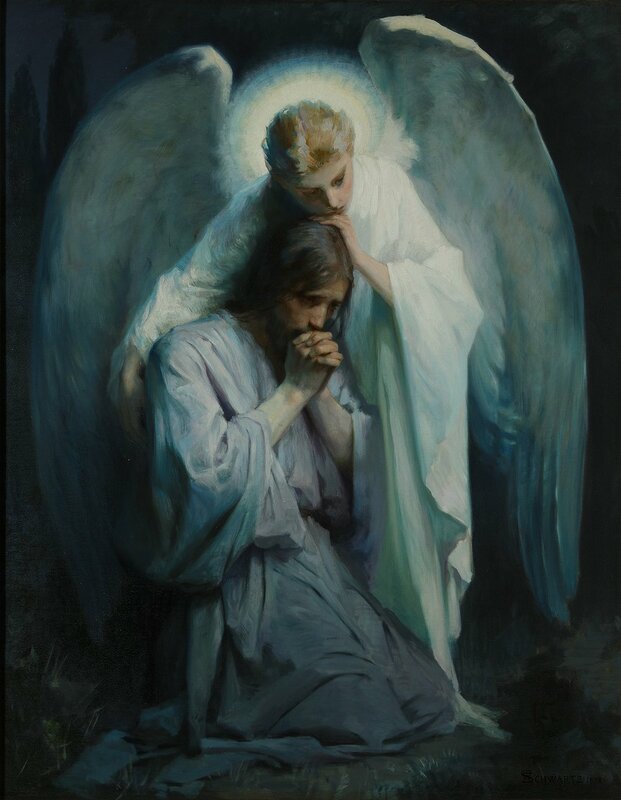 Springville's collection of Utah and LDS Art may be the finest anywhere in the world, including Jesus Christ is the God of that Land by one of the most treasured and reproduced LDS artists of all time, Minerva Teichert. We sit down with Ashlee Whitaker, the Roy and Carol Christensen Curator of Religious Art at BYU to talk about her favorite pieces of religious work in the collection at the BYU Museum of Art. 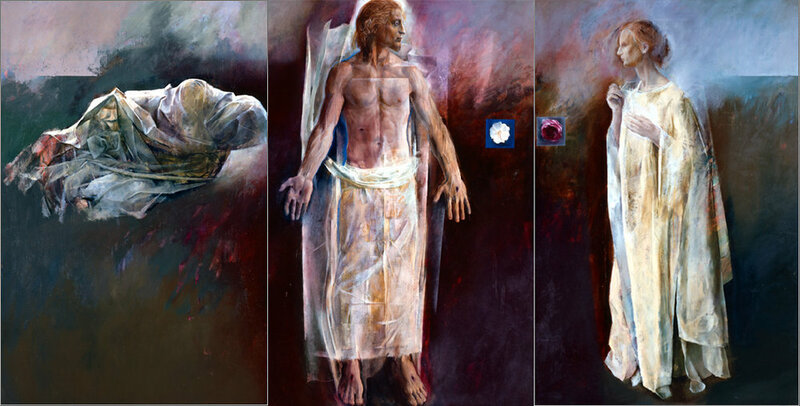 A pair of triptychs by renowned LDS painter Trevor Southey reflect the life of Christ in a style completely unique to Southey and with a depth unparalleled in LDS art. Jesus and Mary: The Moment After by Trevor Southey. Currently on view at the BYU MOA "Magnifying the Lord" Exhibition.